EMLA cream was developed to reduce pain during pulsed-dye laser (PDL) treatment; however, no standard assessment for the therapeutic outcomes of PDL with EMLA creams thus far available. 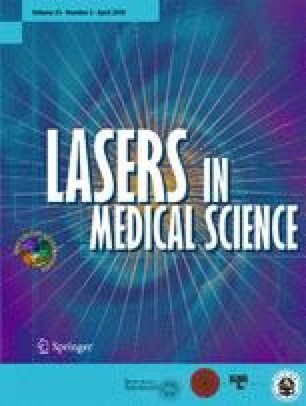 This comparative, prospective clinical trial evaluates laser efficacy and pain reduction during PDL treatment with EMLA cream for local topical anesthesia. Nineteen patients with untreated port-wine stain (PWS) were treated using PDL and examined in this study. Treatment specifications included Vbeam® PDL (Candela Corp.), 595-nm wavelength, 9 J/cm2 radiant exposure, 0.45 ms pulse duration, 10 mm spot size, and cryogen spray cooling (40 ms cooling plus a 20 ms delay). A topical anesthetic (EMLA cream: 2.5% lidocaine and 2.5% prilocaine) and a placebo were applied to two respective testing areas on all patients prior to treatment. The visual analog scale (VAS) was used for pain assessment. Clinical therapeutic outcomes were evaluated by visual evaluation and with the use of a chromameter 2 months after 3PDL treatments. The average VAS scores were 3.15 ± 0.95 and 8 ± 0.57 for the EMLA cream site and the placebo site, respectively, at a significance level p < 0.001. The EMLA cream site and the placebo site had clearance or fading rates of 45.08 and 44.12%, respectively (p < 0.05). No serious side effects were reported. Patients reported a consistent decrease in pain during PDL treatment when the topical anesthetic EMLA cream was administered. Treatment of PWS by PDL with EMLA cream does not lead to a decrease in efficacy or an increase in side effects; instead, it significantly reduces pain during treatment. EMLA cream is a safe and effective local topical anesthetic for PWS treatment by PDL. This study was supported by grants of the National Natural Science Foundation of China (no. 81602777). Informed consent was obtained from all individual participants of the study.